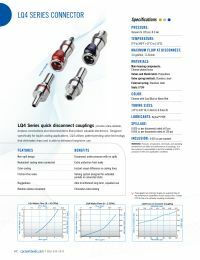 Colder’s LQ4 Series couplings are designed specifically for liquid cooling applications and utilize a new patent-pending liquid cooling valve technology. The LQ4's closed-system design and automatic non-spill shutoff valves provide dripless connections and disconnections to protect valuable electronics, even after long-term and repeated use. Also available in red.